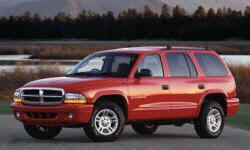 Dodge Durango Pros and Cons | Page 1 of 1 | Why Not This Car? A real step up from past Dodges and on par with vehicles costing more. Soft touch materials everywhere, efficient lay out of controls. Accent lighting looks great at night. the hemi has great torque, easy merging and passing. The four wheel drive is perfect for poor roads and weather. 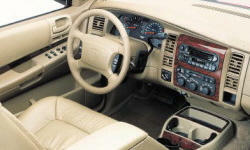 The interior is beautiful and very comfortable. The 4.7 is a great engine with plenty of power and performance. 2003 was the first year for the five speed automatic and it has been flawless. Very smooth shifting - you really never notice it. The Hemi performs faultlessly. Floats along at 1800-1900 RPM at 70mph. All the power you need when called on. At a steady cruise control 60MPH, we typically get 18-19 MPG on the interstate and 14.5 - 15.9 in city driving. Too "blocky", sits way too high leaving too large gap in wheel well. Great breaking capabilities for being such a heavy vehicle. There is a lot of brake dust with stock parts, but I will change brake pads to another brand when the time comes. 7,000 lb towing capacity and pre-wired with 7 way connector makes for a fairly comfortable towing platform. The rear cargo area is pretty big when the 3rd row is folded. Folding the 2nd row adds more capacity. Space behind the 3rd row is small however.